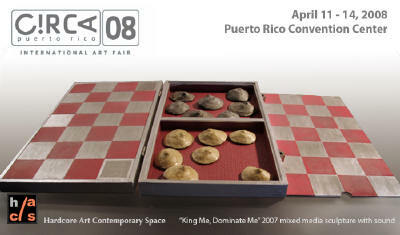 This in my inbox – an international art fair to “give visibility to the Caribbean art world.” Participant Grimanesa Amoros was a resident artist at Artspace several years ago. She was making paper then, for a wonderful kind of seaweed documentary I will get back to sometime, but she really does whatever in the world she needs to do in order to create art in the most fantastic and sometimes unlikely venues. The one below was visible each day to certain New York City commuters, from the MTA Metro North platform, as well as people walking the Harlem streets below. Commisioned by real estate developer Eugene Giscombe for the Lee Building at 125th Street and Park Avenue, the installation was inspired by “his passionate interest in exotic, wild animals, and Harlem itself.” Check out the video to get a better idea. The installation was created by projecting colored lights in a deliberate, looped sequence, controlled by a computer onto rear projection screens covering large windows. Over-sized silhouettes of animals made of foamboard, painted black create moving shadows in the windows. The sequence begins just before sunset and ends just before sunrise. The lighting controller calculates these astronomical events based on the location of New York City (40° 46’N x 73° 58’W) and its five time zone west difference from Greenwich /Mean Time. Just got another e-mail – wouldn’t it be fun to find her booth in Switzerland! Grimanesa, you are one traveling woman! Have fun! Basel – SCOPE, the cutting-edge contemporary art fair, returns for the second year to Basel in a new venue, a 60,000 square foot glass pavilion situated on the Rhine. Within walking distance of Art Basel 39, SCOPE will present its most international fair yet, showcasing 85 galleries from all over the world.